Kaitlyn Sheehan—a Registered Nurse—had an idea for a mobile app that could improve health care on both sides of the Detroit-Windsor border. Her cross-border idea likely emerged from her dual employment as an RN at the Windsor Regional Hospital Cardiac Catherization Lab and the Cardiothoracic Intensive Care Unit at Harper University Hospital in the Detroit Medical Center. She called her app Stent Tracker – a web-based app synched to a patient’s smartphone that allows them to store their cardiac stent information, manage and schedule their medication list, and provides an educational tool on heart health after a patient undergoes coronary angioplasty. Kaitlyn understands hearts and heart patients. What she lacked is the tech chops to bring her mobile app to life. Enter Hacking Health Windsor Detroit – the first cross-border Hacking Health in the world organized by TechTown Detroit, WEtech Alliance and Hackforge that brought together over 200 professionals and students from the Health Care and IT sectors. Over the May 1st weekend, Kaitlyn and other nurses, doctors, pharmacists and hospital administrators teamed up with programmers, designers and business mentors at TechTown Detroit—a business incubator minutes from the US-Canada tunnel—to dream up, design and build mobile applications for health care. At the kick-off on Friday night, Kaitlyn joined thirty other innovators who pitched their ideas to a packed house at TechTown. By Saturday morning, she had recruited two other medical students from McMaster University and two programmers. The programmers were part of a team of tech mentors provided by Next Healthcare Technologies – a spinoff startup from a longstanding Windsor-based IT company called Next Dimension. Further highlighting the promise of a cross-border health corridor, Next Healthcare had recently launched out of TechTown Detroit to go after the American market. And there’s the magic– a cross-border nurse teaming up with a cross-border tech startup at the first cross-border Hacking Health in the world. Stent Tracker was awarded two prizes—the Overall Judges Favourite and the Highest Potential for Adoption, which included registration to the eHealth Conference in Toronto and six months of commercialization support from WEtech Alliance and the Downtown Windsor Business Accelerator. A total of $30,000 worth of prizes were handed out to a number of teams. The prize for Best Caregiver/Patient Management App and Best Clinical App were awarded to Dr. Michael Lanham from University of Michigan Health System and his team for On Track – an In-Vitro Fertilization (IVF) app. The awards include commercialization support from Henry Ford Innovation Institute and SPARK Ann Arbor. A team comprising students from Wayne State University, University of Michigan and Oakland University received both the Best Student Team from the U.S. and the People’s Choice Award for PRN Care – a location-based app that connects certified individual home care providers together with families seeking care for elderly family members. The award includes incubator space and commercialization support through the DTX Launch program at TechTown Detroit in addition to four MYO remote-control wristbands. The Best Student Team from Canada prize was handed to a truly unique and collaborative effort. The only high school students in the competition came from Leamington District Secondary School and they teamed up with Leamington District Memorial Hospital and tech mentors from St. Clair College to develop a student designed mental health app for students called The Moment. As part of the prize, the tech mentors from St. Clair College were invited to participate in the EPIC Founders program at the University of Windsor’s EPICentre – an invaluable summer commercialization program with $6,000 in cash per participant. The Highest Potential for Social/Patient Impact prize was given to a mobile app called Caregiver Connect, which improves communication between providers of healthcare services to long-term care residents and their families/caregivers. The prize included incubator space and mentoring at TechTown’s Junction 440. Although we learned it’s a very Canadian thing to say that all participants came away winners – that simply was the truth. In addition to prizes – the participants had the opportunity to listen to inspiring speakers such as Dr. Ketan Patel – a doctor turned tech entrepreneur – who talked about the need to find and follow your own entrepreneurial spark. The Consul and Trade Commissioner for the Consulate General of Canada – Sebastien Roy – talked about the promise of cross-border collaboration, while Dr. Steven Lanier—Vice President of Research at Wayne State University—was enthusiastic about the innovation cluster bubbling beneath the surface. Additional speakers included Ward Detwiler – Project Manager at Henry Ford Innovations; Nicole Sleiman – Program Director at EPICentre; and Marty Carmody – Senior Accounts Manager at Microsoft. All brought inspiration. Participants came as innovators and left as entrepreneurs – energized and armed with new networks and new resources as they begin to traverse the road from ideation to commercialization. 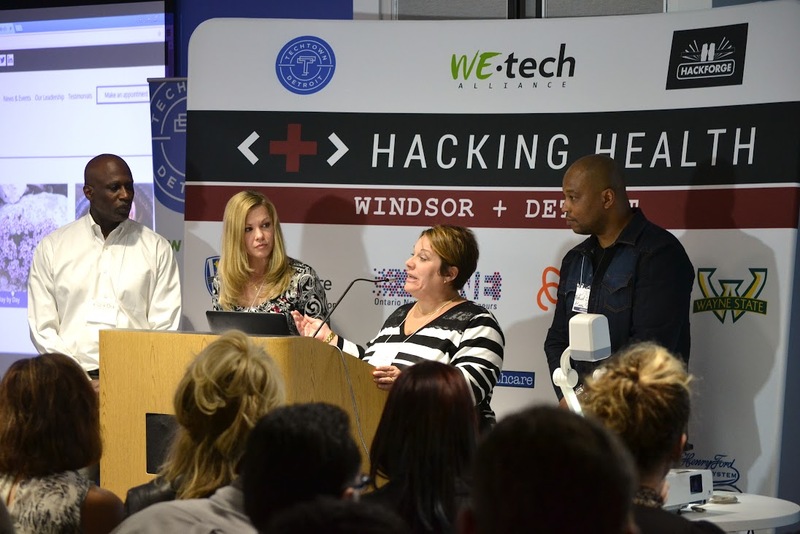 Many will return next year when Windsor hosts the next Hacking Health. In the meantime – less formal Hacking Health Cafes are planned to keep the cross-border conversation going. For information on how to get involved in both contact WEtech Alliance or TechTown Detroit. For the region – TechTown Detroit and WEtech Alliance established yet another bridge for deeper cross-border collaboration that will hopefully catalyze regional innovation and economic development.